Ah, the beloved greasy spoon—those quick, inexpensive restaurants where you can find comfort food at almost any hour. Unless they’ve gone the way of the chain, few of these vestiges of yesteryear remain today, and probably even fewer are flourishing. A clear exception is Joey’s Pancake House in Maggie Valley, which celebrates 50 years in June. Opened in 1966 by Brenda O’Keefe and her late husband, Joey, the expansive restaurant serves anywhere between 600 and 900 people daily for breakfast and lunch, and during the busy season, it’s not uncommon to see a line of 200 hungry patrons trickling out the door. The menu is a breakfast-lover’s dream: eggs any way you like them, meats galore, omelets and Benedicts, crisp waffles, and, of course, pancakes, both traditional and inventive. Many items are sourced locally and seasonally, but even that’s not Joey’s secret to success. “It’s a community establishment,” says Brenda, who always wears a warm smile and tends to both her employees and customers like a mama hen. Joey and Brenda had worked for a fine hotel in Miami, where they fell in love. 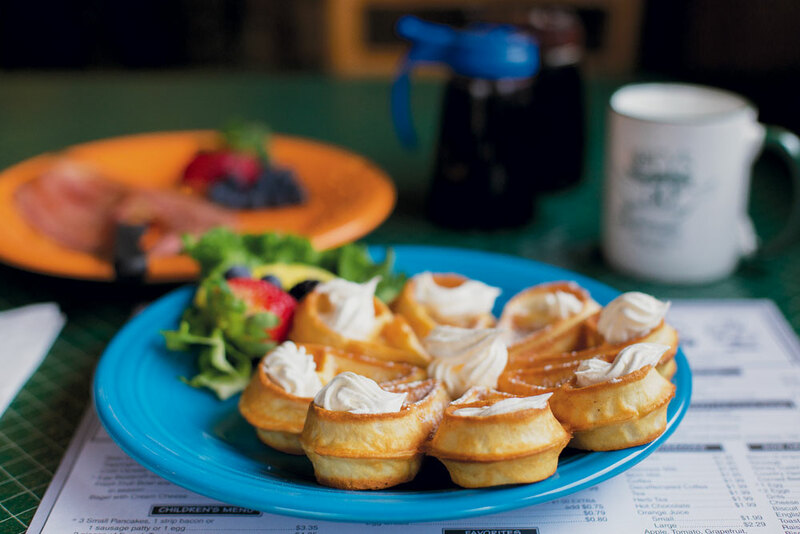 Hopes of owning their own hotel brought them north, but they ultimately decided to open a restaurant that catered to the droves of breakfast-seeking tourists visiting theme parks and the Great Smoky Mountains. “It’s not about the money,” says Brenda, “it’s about the life.” The couple would wake early and work hard until noon, then play all day. The restaurant was seasonal at that time, so they spent their winters in the warmer climes of Florida. Though as the business grew, so did their commitment to it. The couple put a premium on guest satisfaction, knowing that in order to appease your patrons, you have to keep your employees happy. Brenda handpicks her staff, often selecting those who need work the most, training them, and treating them as family. “If you give people a job, they’ll earn money, and we’ll all do better,” she says. She even operates a foreign exchange program that puts Eastern European grad students to work. For Joey’s 50th, Brenda asked her supporters to share stories and sentiments about the restaurant for a book she’s created—and she was answered with the kind of overwhelming response you’d expect for a place that’s stayed true to its pancakes for half a century.